As a new exhibition commemorates the Somali effort during the First World War, LSE’s Joanna Lewis analyses how scholarship of the Great War is increasingly encompassing the global contribution of the conflict. This year marks the centenary of the end of the First World War (1914-18). In London, one of the most famous WW1 memorials can be found in Hyde Park. The Royal Artillery Memorial features a giant sculpture of an artillery gun. Beneath are four bronze figures of British artillerymen positioned around the stone centre. It is a memorial that was initially criticised for depicting a more real, brutalistic image of war. The faceless men are exhausted; powerful but ordinary rank and file masculinity is stretched to breaking; one soldier actually lays dead before us. Capturing that spirit of realism, SAAFI (the Somali Advice and Forum of Information, based in north-west London) have curated an exhibition to highlight the overlooked Somali experience of the conflict. 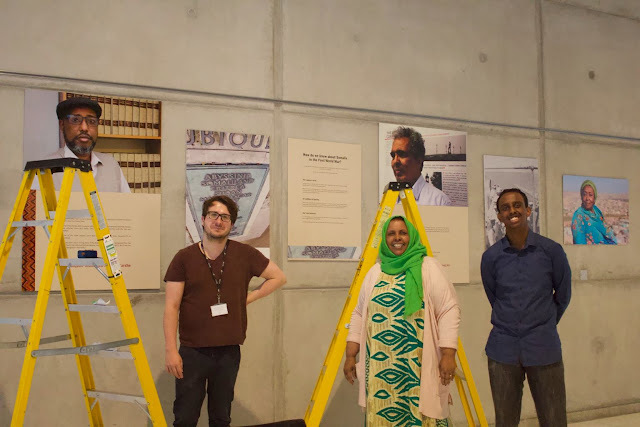 Formally launched on 16 June 2018, at Brent Civic Centre, this impressive and fascinating exhibition sensitively documents how Somalis were caught up in the conflict in different ways, and also its impact. Working with Brent Museums and Archives, the Somaliland Scouts Association (the British colonial regiment in the region famous for its camel corps) and with the aid of a Heritage Lottery fund, months of hard work have resulted in a Somalis in The First World War exhibition. One of the highlights is a portrait photo of Yusuf Dualeh Amarreh, who fought in the war, and the display of his medals, thanks to his grand-daughter, the famous health care pioneer, Dr Edna Adan. The exhibition has been inspired, sustained and co-ordinated by the founder of SAAFI, its dynamic Director, Mrs Rhoda Ibrahim, a pillar in the London-Somali community, ably assisted by Mrs Nimo Hussein. In her opening address Rhoda Ibrahim thanked all the stakeholders, contributors and volunteers for making such an initiative possible. It was an event which, she said, underscored the historical connections between the Somali and British people, and was a celebration of the deep emotional roots that sustained a multi-cultural twenty-first century. Her own father had fought in the conflict. In fact, he became the iconic image of the Somali askari (soldier) since he famously appears on a Somali-British stamp commemorating the end of the conflict, standing tall and proud, and facing danger head on. This exhibition is part of a broader historical zeitgeist. There is a new recognition of the global and multi-national dynamics within national histories, such as the rise and fall of the British Empire (the most powerful empire the world has ever endured, covering a quarter of the earth’s surface at its height). So not surprisingly scholarship on the First World War now in the final year of its centenary anniversary, has re-rooted and re-routed itself in the global contribution and fall-out of the conflict. Of course, it is important not to forget the carnage and loss of a generation on the Western Front – the horror of the trenches. However, the contributions of people from all over the empire on the battlefield and in secondary roles supplying materials, foodstuffs and so on, is becoming a much more established feature of how we understand the First World War – de-centering it from the fields of Flanders. The Somali experience of the conflict is, as this exhibition makes clear, multi-faceted and complex. It is estimated that about 60 Somalis fought in Europe. Many more served in the Somali Camel Corps and provided back-up to the military effort. A considerable number served in the Kings Africa Rifles too. Africa and Africans were caught up in the conflict on their soil, diverting much needed manpower and resources into the war and away from infrastructure and social services. Somali-British history has a long past which is only latterly being fully appreciated. Many British port cities have established Somali communities which grew out of the presence of Somali sailors settling there. Long prized by European maritime forces along with Indian and South Asian sailors (all shamefully paid a pittance), the role of skilled Somali and Yemen shipmen increased dramatically with the opening of the Suez Canal in 1868, which enabled increasingly competitive European powers to move through the Gulf of Aden, up until then known as the Gulf of Berbera, named after this important regional maritime port on the northern Somali coast. It is argued that Somali sailors fought alongside Lord Nelson at the Battle of Trafalgar; and my own research suggests Somalis could have been present on the steamship which carried the body of explorer Dr David Livingstone home from Zanzibar in 1874. By this time, three major European imperial powers Britain, Italy and France were heavily involved in the area following the decline of the Ottoman Empire, having signed various protectorate treaties with the ruling Somali Sultans. The Ethiopian Empire also sought to expand its influence in the region. Meanwhile, the Dervish State, established by the religious leader Mohammed Abdullah Hassan pushed the British back to the coastal region, remaining independent throughout World War (Only in 1920 were the Dervishes defeated, Britain sadly using aircraft bombing for the first time in Africa). Somalis were caught up in this conflict, with backers on both sides, and after the war, large numbers were displaced, and had to settle in what is today Northern Kenya. Acknowledging and understanding the complexities of this conflict on the ground is a great achievement. This exhibition can boast a number of other achievements too. It has brought members of the Somali community together in Brent to share their memories. It has resulted in an exhibition of text and objects which itself will go global. For the main exhibition will move from Brent Museum and Archives to Hargeisa, the capital city of Somaliland and be freely available to visit on African soil. Fundamentally, this exhibition has drawn attention to the hitherto neglected history of Somalis and the First World War. For how many people have actually read the list of nations that contributed to the First World War carved into the famous war memorial in Hyde Park. If they had, they would see that Somaliland is second on that list which surprises many. The quote used for the memorial comes from William Shakespeare: “There was royal fellowship of death”. A global one might be more accurate. Somalis in the First World War Exhibition will be on display at Brent Museum and Archives in Willesden Green Library from 1 October 2018 to 8 January 2019. The main exhibition will be on display in Hargeisa, Somaliland from 1 November – 30 November 2018. Visit the the Somali Advice and Forum of Information (SAAFI) website or email rhoda Ibrahim: Saafi-org@hotmail.co.uk.